Recommended for low-pressure applications that require steady flow. Fuel pressure regulators factory adjusted to 2.7 psi with a 1-4 psi range. Accepts 3/8" NPT fittings. Adjusts from 4.5 to 9 psi. Also good as a high-pressure bypass. 2 regulators are recommended for dual 4-barrel applications. Accepts 3/8" NPT fittings. 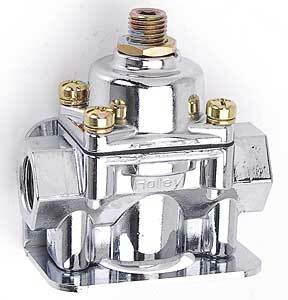 Die-cast aluminum regulator adjusts from 4.5 to 9 psi. Least restrictive, highest flowing production regulator with one 1/2" NPT inlet port and two 1/2" NPT outlet ports. Mounting hardware included.